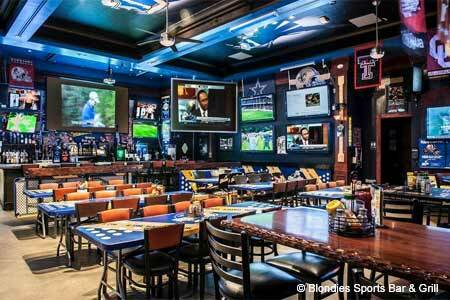 Blondies entices sports fans with bar snacks, drink specials and a few dozen plasma and big-screen TVs. About the restaurant: Blondies entices fans away from the sports book to its spot in the Miracle Mile Shops with a few dozen plasma and big-screen TVs, plenty of drink specials, and a bevy of waitresses attired in cheerleading outfits. About the food and drinks: Fill up on snacks like sweet potato fries or nachos while taking advantage of the happy hour special --- all-you-can-drink draft and well drinks for $20 weekdays from 3 p.m.-6 p.m. and 10 p.m.-1 a.m. Pizzas and sandwiches dominate the menu, but a few beyond-bar-food options include New York steak, rib-eye and Atlantic salmon. Satisfy your sweet tooth with a brownie and ice cream. Diners can also get into the competitive spirit during weekly beer pong tournaments on Wednesdays.